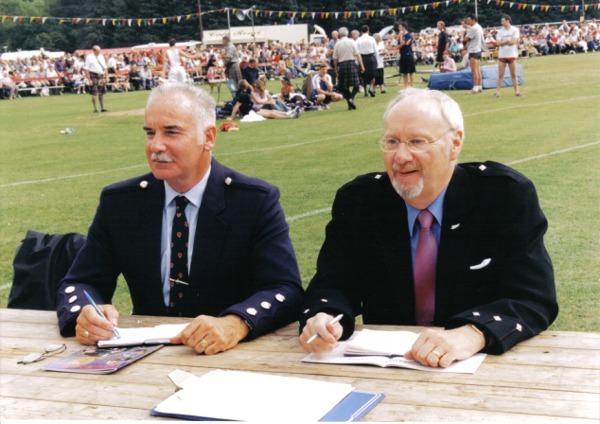 Through the 11 years this writer has been writing a monthly column on the world of Highland Dancing I have had to read and research numerous documents, organisational minutes, and historical happenings as they pertain to Highland Dancing. The intrigues, the ins and outs of political maneuvering the “history of highland happenings” in the past 25 years of paper work has a cast of participants that are still jostling for position today. In most situations in that time nine times out of ten the name McGuire was there in the mix whether it be the name on a World Championship trophy, or in newspaper reports of challenges to the a World Championship Title or challenges to the rules of the SOBHD. The name McGuire and in particular the name of Alex McGuire has become synonymous as a Highland Dancing advocate. The road has not been easy, maybe a less tenacious individual would have chucked it in years ago. Certainly it would be understandable there have been less than flattering references to Alex McGuire and the SOHDA over the years such as the letter to The Scottish Games Association and Mr. Andrew Rettie from Mr. Billy Forsyth promoting the registration scheme in the 90’s which effectively closed out the SOHDA and “open “ dancing “ There were always people in Highland Dancing who could not accept that their particular viewpoint was not the wish of the majority. Over the years their numbers decreased (Alex McGuire and SOHDA) “ and stating “the overall total (SOBHD registered dancers) might be as high as 50,000”(letter from SOBHD, Billy Forsyth to SGA). “My “active” dancing career spanned some 31 years and has, indeed, been exceptionally kind and I thank God for the opportunities that it has presented to me. During this time I danced competitively, did stage and television work and took part in concerts and cabarets in various countries around the world. Through the Art of Highland dancing I was enabled, because of my Equity card granted through TV appearances, to perform a variety of “Extra Work” on television. I also took to the amateur stage appearing as a dancer in productions such as Brigadoon, Annie Get Your Gun, and Cabaret etc. The countries/places that I visited and did concerts include England, France, Holland, Belgium, Spanish mainland, Majorca, Germany, the former Soviet Union - inclusive of Ukraine, Latvia, Lithuania, Estonia, Azerbaijan all ending up in Moscow. In the United States, I performed in Minneapolis MN, North Carolina, various parts of California including, Malibu, Stanford, Chico, Carmel, Santa Barbara, Pasadena, Riverside - Manchester NH and finally in Boston MASS. All of this, despite the fact that I was able to hold down a full time job for which I must thank my employer for giving me the time off although, I tried very hard not to abuse the privilege. HD: When did you start dancing and why? How long did you dance, what were the high point and the low point in your dancing years? AM: “I started dancing at the comparatively late age of 14 years. The reason was because of the wonderful successes of my younger sister, Rosemary. As a young boy I used to travel with Rosemary accompanied by, at first my Mother and, latterly by my Father, to competitions all over Scotland and was utterly “knocked out” with Rosemary’s successes. It was not unusual for Rosemary to attain six or seven first placings – in these days it amounted to every first in the competition. I also traveled to her classes just to see her dance and, when I think back, I was awe struck at her performances. She was so good that she pushed the boundaries of Highland dancing – this was what inspired me! I began competition dancing at the age of 16 years and my very first competition was at Tomintoul Highland Games in the Highlands of Scotland where I danced in the Adult section. The high point in my dancing years was, undoubtedly, to see Rosemary win all six World Championships, Juvenile, Junior and Adult, which was, at the time, an all time record – I was so proud, as was my Mother, Father and all of her six brothers and four sisters.